Politics is about power. Everything else is just window dressing. In politics the only things that really matter are gaining power, maintaining power, increasing power or losing power, and much of the discourse within news falls into one or more of these categories. Endless comment about the nuances of policy or the ever shifting alliances between individual politicians or parties and how this may impact upon the balance of political power are at the core of much of our news reporting. Yet, this media comment serves to frame and structure debate surrounding politics in a very narrow way, one that emphasises the importance of individuals and parties within a very particular system. Ever since the advent of mass communications, particularly television, a three sided game has been played between politicians, the media and the public; all the players hold some of the cards needed to win this never-ending contest. Politicians need the media to get their message across to the public and build support, while, in turn, the media need politicians to create and frame news agendas (which are usually dominated either directly or indirectly by political issues – reports from a committee on A, a response from the Minister about B, calls to reform C, a statement about D etc) which they also use to justify a public service function. Like celebrity culture, there is a cycle of dependence between the media and political elites; they need each other. And just like the audience of a tv talent show, we too get a chance to participate and cast our votes for who impressed us with the best song-and-dance routine on the day. Yet, in our increasingly globalised world dominated by the invisible hand of ‘the markets’ whose ever shifting sentiments appear to be able to make or break countries with impunity, the power of national politicians has been slowly ebbing away. Finance and the influence of global corporations have produced a situation in which national power has, to a large degree, been hollowed out and where almost every substantial political policy or action is informed with reference to how these trans-national players will react. In effect the political system within countries has become nothing more than a means of managing the population, with parties offering differences in nuance rather than substance. The cut and thrust of politics is, in many ways, a mere facade designed to conceal the real absence of substantive debate. Alternatives are always presented in such a way that they fall within the limits set by the broader system; radical viewpoints or alternatives are condescendingly dismissed as unreal or unworkable in the ‘real world’. Challenges to the status quo only become possible after a dramatic shock (a war, natural disaster, sudden economic collapse or some other catastrophe) when the shortcomings of the political system are laid bare and a brief window of opportunity appears within which alternatives can be contemplated. In conjunction with this hollowing out of real power, politicians have increasingly become concerned about carefully controlling their public image and how they are seen and perceived. Historically, the first real attempt to disrupt the facade of power projected by politicians was made by Erich Solomon during the 1920 and 30s, when his chutzpah and concealed cameras exposed the behind-the-scenes goings on of the great and good to the public. Foaming like rabid dogs at the latest results from a focus group or an opinion poll, contemporary politicians are insatiable in their search to capture the elusive median voter who is the key to electoral success. Deception is praised as political cunning. Formulations of words are used to convince people that what appeared to be a straightforward promise made last year was in fact no such thing and, anyway, circumstances have changed since then so it’s impossible to do that now. (Recessions always bring out the twin sisters of WAWA and TINA [‘We Are Where we Are’ and ‘There Is No Alternative’] who politicians just love to blame for inaction.) Substance becomes spin. With the advent of mass communications, particularly from television onwards, politicians have been struggling to ‘connect’ with their public while simultaneously striving to control how the media represents them through image consultants and PR people. In response to these demands from journalists and news-makers, politicians have tried to restrict the situations within which the media have access to them (press conferences, photo opportunities, media-events etc.) in order to minimise the chances of negative portrayal while ensuring that their message gets across. Turning to the book itself, Barón has ambitiously attempted to deconstruct the visual rhetoric of political imagery and look beyond the facade to what lies beneath. Within photojournalism some wry images and a slight subversion of the veneer of power is permissible; fleeting glances and momentary expressions are frozen by the camera lens during otherwise carefully choreographed photo-opportunities (or the unwary politician may position themselves near a backdrop or some other inappropriate prop which will leave them open to ridicule) and are then captioned to either poke fun or provide a visual shorthand for the opinions of a pundit. Such images are the standard fodder of newspapers (we see them over and over again) and they form the acceptable limits of visual criticism within the news photography of politics. But in many ways they still serve to underscore the importance and primacy of the politician concerned; being the subject of such attention means that they possess a degree of status that implies importance. Censorship in this case is not the case of a dour, humourless official determining what is permissible to publish; in democratic political systems it’s much more subtle. Freedom of the press is constrained by the unwritten rules of the game (or ‘news values’ as Galtung and Ruge call them) that determine the choice of one story/image over another, the prominence it receives, where its placed in the newspaper/report, how it is analysed and understood. (Transgress the rules of the game and there will be political consequences through calls for tighter legislation about intrusive journalism and the right to privacy.) All of these factors are decisions made by the editors and creators of news, who consciously and unconsciously, shape how politics is presented to the public at large. 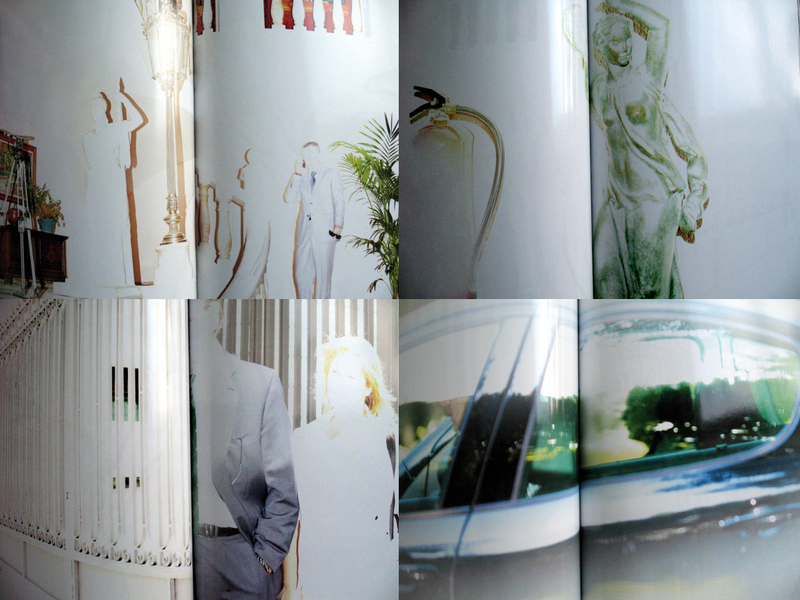 However Barón goes far beyond these superficial and clichéd forms of mild photographic subversion. 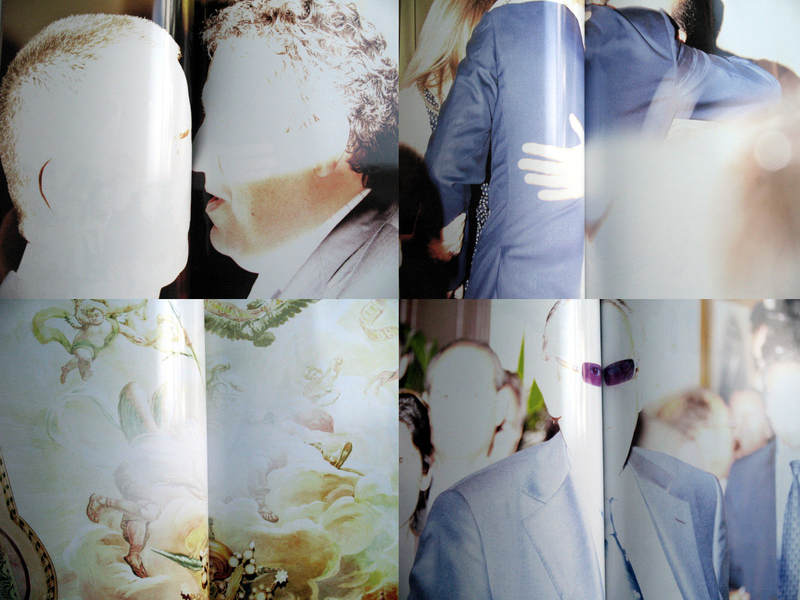 Through the use of flash to overexpose parts of images, bleaching out facial features and rendering political figures as ghostly apparitions, Barón removes the signifiers of individual power that politicians are so desperate to project. Stripped of their carefully crafted political identities, they become blank, hollow shapes; insubstantial spectres wandering the halls of classical buildings, desperate for attention, trying to convince us that they somehow know what’s best. No longer individuals, they become interchangeable parts of a larger system that is desperate to assert its power and relevance to an increasingly sceptical public. Alongside these images, we see fragments of theatre within which this performance is played; neo-classical architecture, frescos, statues, flags and the rest of the tawdry theatrical props needed to convince the great unwashed that these few individuals are important people. These apparitions are the contemporary manifestation of the divine right of kings walking amongst us. Also subjected to Barón’s gaze are the other players in this eternal game; the photojournalists and camera operators who are likewise transformed into blank, ethereal spirits. Only the cameras remain; the individual players are irrelevant, the game is all that matters. 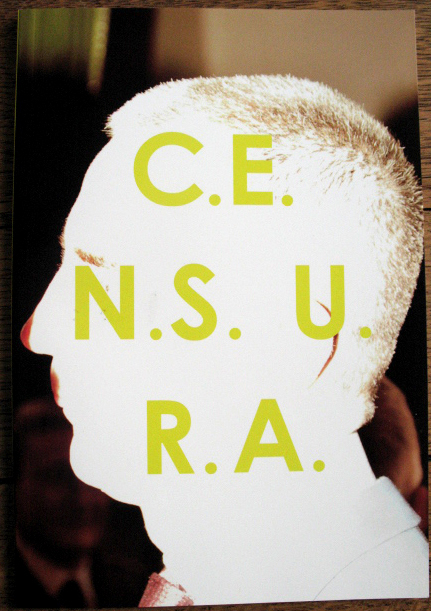 Although this book is about Spain, the critique it makes about the visual manipulation of politics is quite applicable to any country that uses a system of representative democracy and vests a small elite group with immense power checked only by a periodic election every few years. The Spanish political system, still struggling with the legacy of a bitter civil war and forty years of dictatorship, is under severe pressure to deal with the current financial and social crisis that is engulfing the country. With the current massive rate of unemployment (July 2012) there will inevitably be profound social and political outcomes within Spain which will impact on many lives both now and into the future. After such a sudden shock to the entire fabric of a social system there will be consequences. How severe and what these consequences might be depends on how long the pressure cooker is allowed to boil away. In this context, the appearance of control and leadership is everything. Society only works if we have confidence in it. These images strip away the facade of political power, propped up by massive egos, the trappings of state office and the constructions of news media agendas. 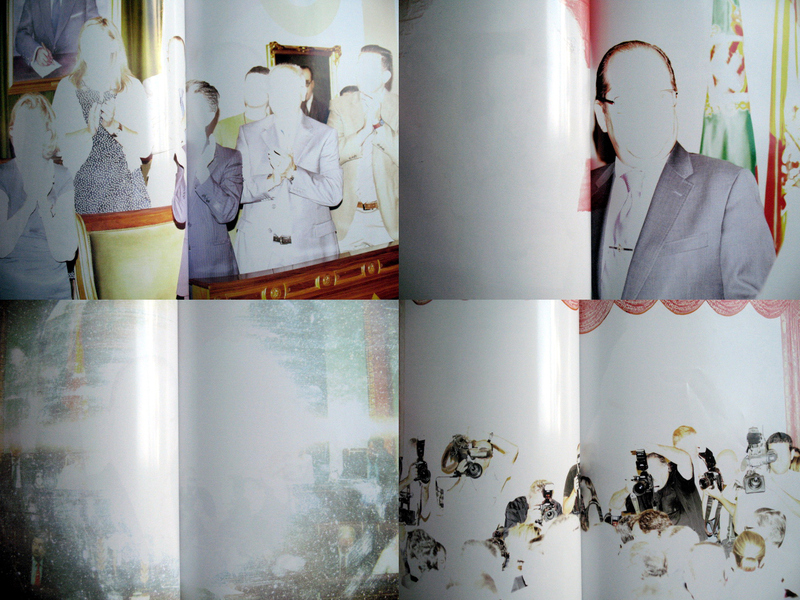 Barón’s images reveal that the emperor has no clothes and more importantly, the emperor has no answers. P.S. 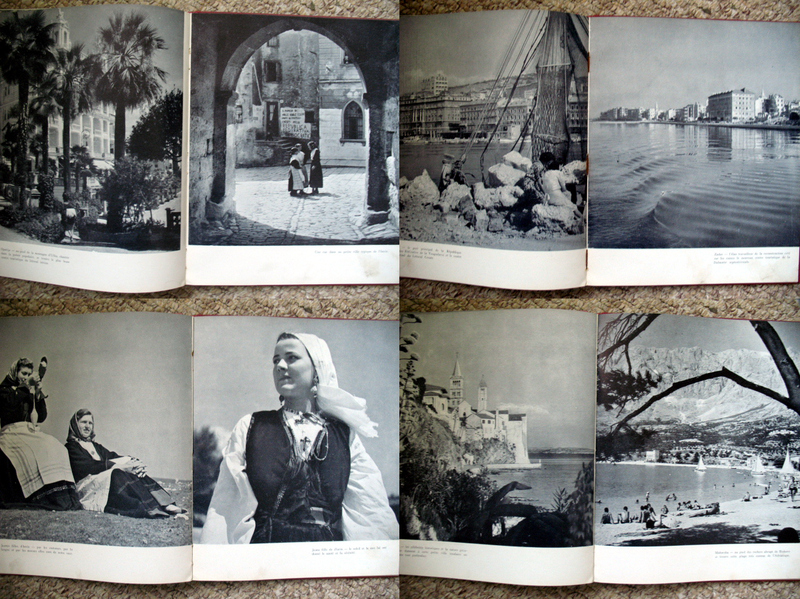 My sincere apologies for the quality of my images here – they are just to convey a sense of the book. Better images and a video presentation can be found on the photographers website here. Yugoslavia, a country that no longer exists, was an entity born initially from the collapse of the old Central and Eastern European empires after World War 1. A loose confederation of a number of different ethnic and religious groups united under a monarchy during the inter-war period, Yugoslavia was invaded by the Germans, Italians and Hungarians in 1941. A violent war of resistance against the Axis invaders ensued with the communist Partisans under Tito, allied with the royalist (mainly Serb) Chetniks under Mihajlovic, in opposition to them (the Chetniks later became more worried about the communist threat and switched sides). The Axis powers dismembered Yugoslavia using the tried and tested technique of divide-and-rule while Croatia became an independent fascist state ruled by the notorious Ustase. As can be imagined this created yet another layer of deep bitterness to a region which has long been riven by ethnic tensions. Tito’s Partisans emerged victorious at the end of the war and he set about establishing a socialist government in Yugoslavia which, if it was to stay in power, entailed sweeping all the various national and ethnic divisions under the carpet. 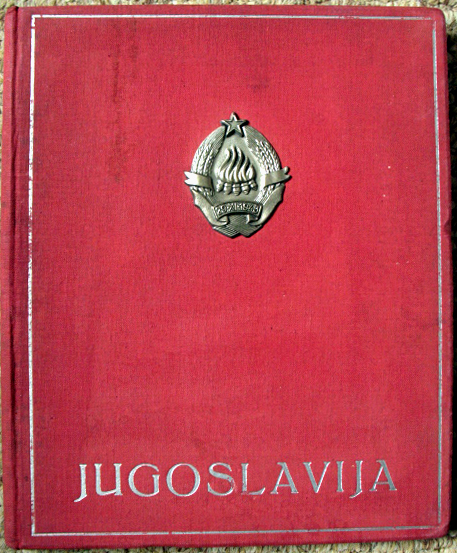 Simply titled Jugoslavija, this book is a small undated red hard-covered publication with photographs credited to Foto Borba and Foto Putnik from Belgrade. Although no date is present, a previous owner has written 1947 in an inscription and the book has the feel and look of a publication produced around that time. 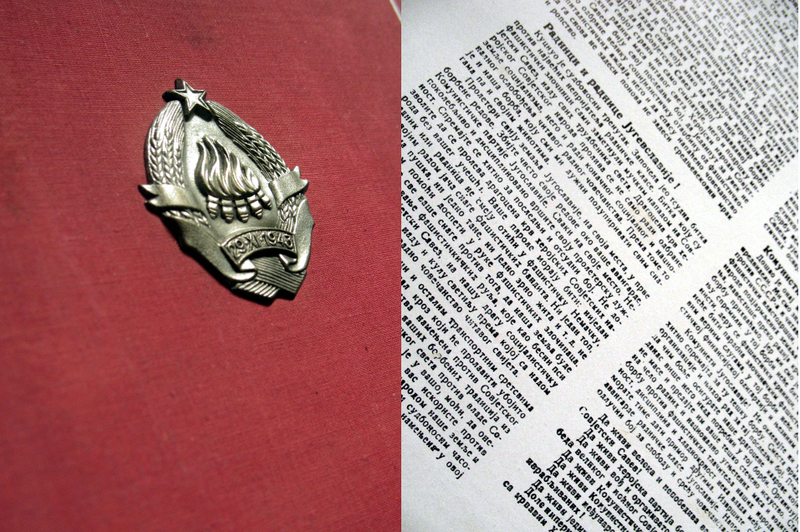 The French language captions accompanying the photographs is the only text present (apart from a cyrillic proclamation.) 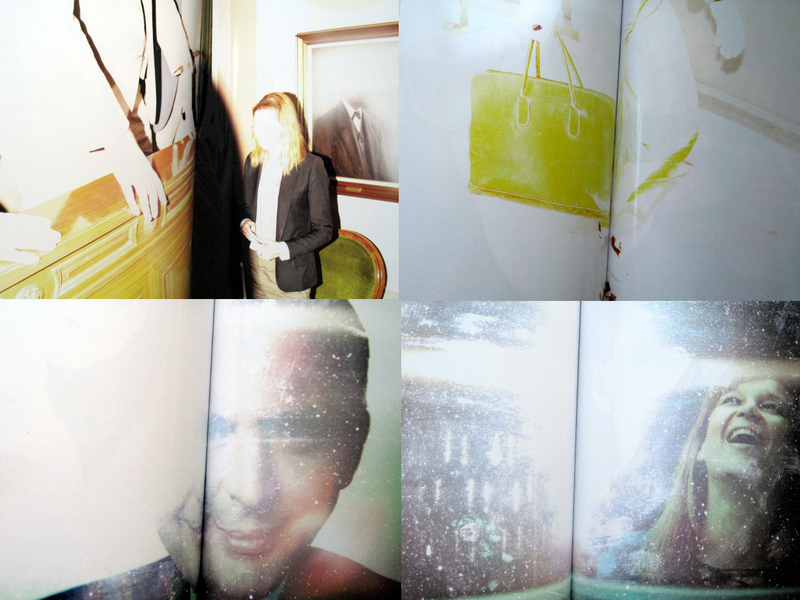 Design wise, this book is quite average with a straightforward layout consisting of a single photo per page. The only aspect that makes it stand out from the crowd is the metal Yugoslav state seal stuck on the front cover (it does make a nasty dent on the other books when you put it in the shelf though). The narrative structure of the book is divided into three sections; the war, reconstruction and the paradise on earth that has been created (or, as the book puts it, ‘the land of sun and health’). A single unifying theme runs through the book; everything is designed to lend credibility to the official myth that everybody in Yugoslavia was united against the Germans and supported the Partisans. Alternative points of view or the fact that there were a number of different groups who strongly opposed Tito’s Partisans have no place in this official, and heavily simplified, version of history. Myth making is integral to the creation and sustainability of nation-states. In effect history is written in such a way as to create a consensus that legitimates the core political ideology of the state in question. This in turn creates the perception that the current status quo is merely an inevitable, natural progression from these so-called historical facts. Mythical history, or the official version of it, creates the rules within which the political game is played within every country. Nation building (the formation and creation of a stable national identity in which certain values are regarded as being a natural and inevitable part of everyday life) lies at the heart of every artificial political entity we know as a ‘state’ or country and, without it, the long term viability of a state/country is impossible. Most of the people living in a country actually have to believe in (or at least go along with) the ideals and values that are part and parcel of the historical myth that in turn makes them different from all the other countries and peoples in the world. Yugoslavia failed to create this stable, unified national consensus. Instead, the various wounds and grievances were allowed fester beneath a facade of outward compliance to the state which erupted into violence once the control of the Yugoslav state collapsed in the early 1990s. 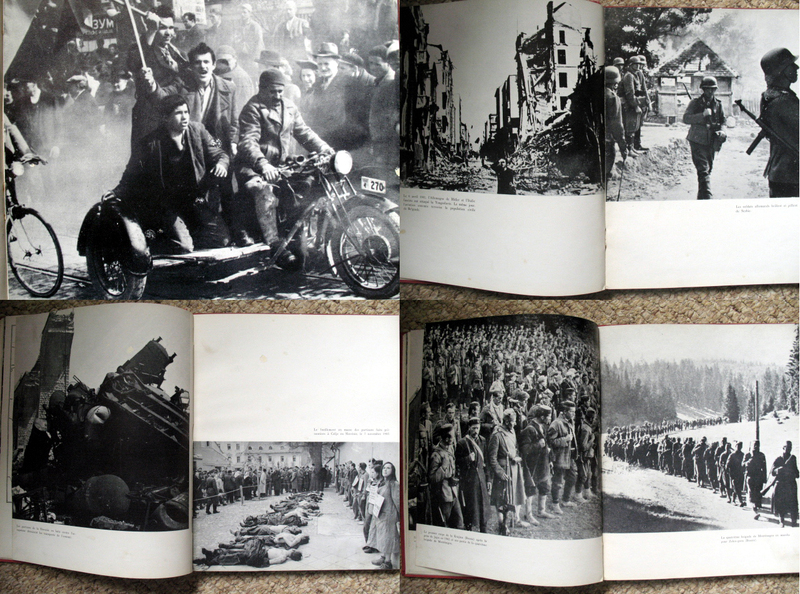 The first section depicting the war years is relatively straightforward; the barbarity of German soldiers burning villages and executing people are contrasted with the discipline and order of the partisans. 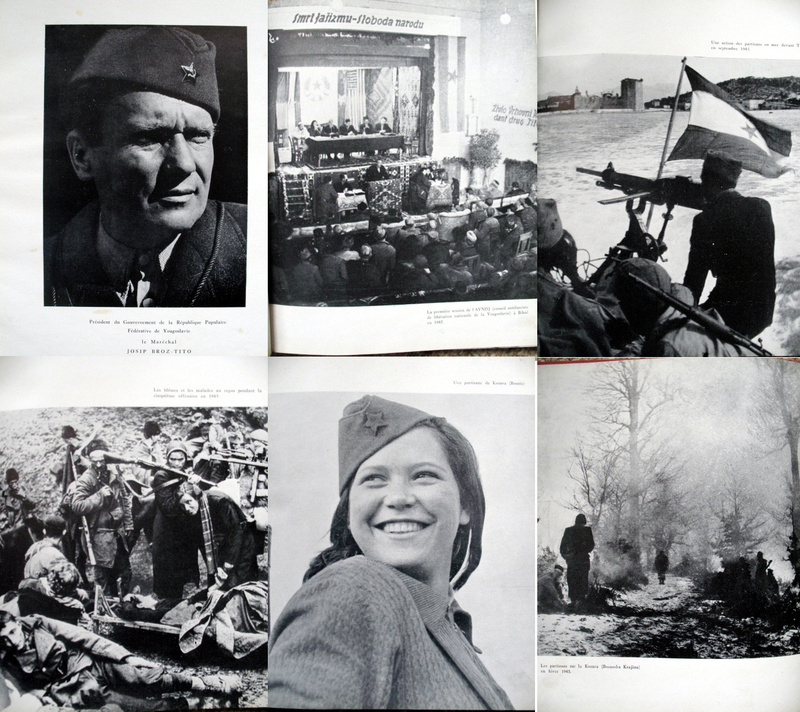 A number of images show the partisans marching in step and holding political meetings which are designed to show that Tito’s group is the only genuine representatives of the Yugoslav people. 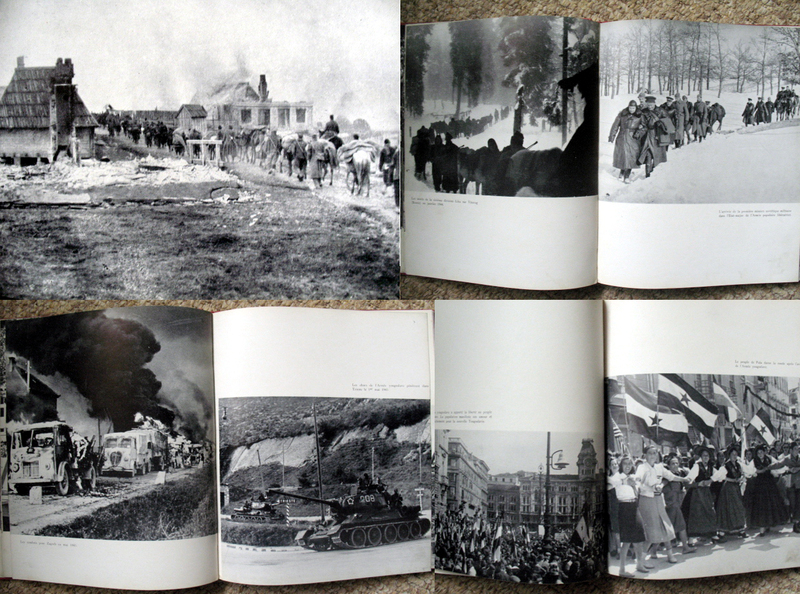 The tempo increases in the final series of images within this section; Partisan forces massing for an attack, artillery blasting away, the smoking remains of a battle and finally the victorious Partisan tanks entering a town, all followed by images of celebratory crowds greeting their liberators are designed to construct a historical narrative. All these images are designed to reinforce the message that the Partisans alone defeated the Germans and therefore they are the only legitimate government. Following on from the victory the book now shows us the reconstruction effort. 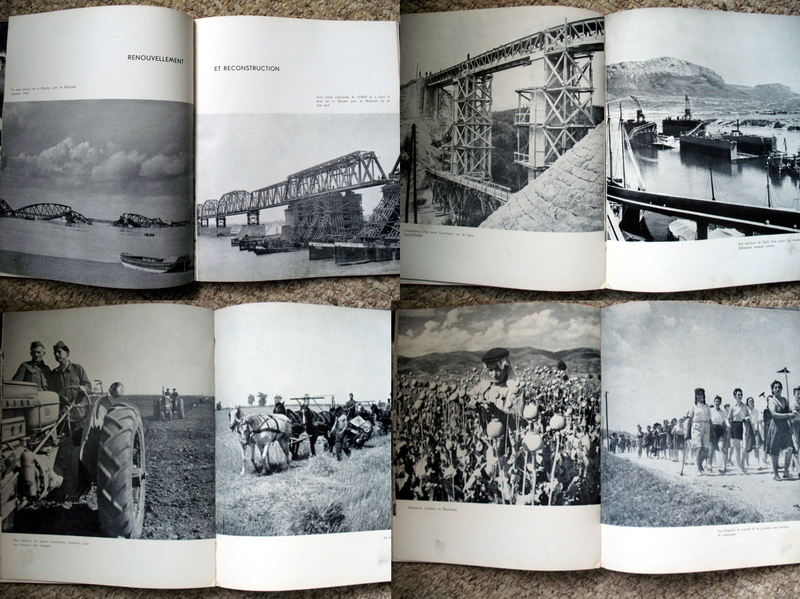 Bridge building is an easy metaphor for people to grasp and it appears at the beginning of this section, followed by the inevitable images of people carting wheelbarrows, building houses, harvesting crops and happily working to repair the damage done by the war. Again, the message of these photos is crystal clear; the entire country has been united under Tito’s guidance and is working collectively to produce a new and better society for the future. 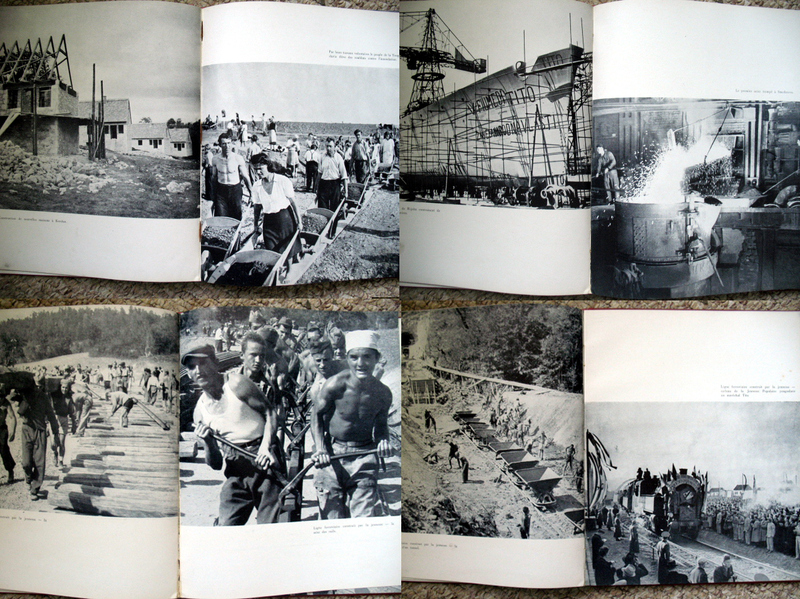 The images of the toiling workers reinforce the idea that collective self-sacrifice in the name of a greater good will assuredly produce a brighter utopian future for a happy and content Yugoslavia. 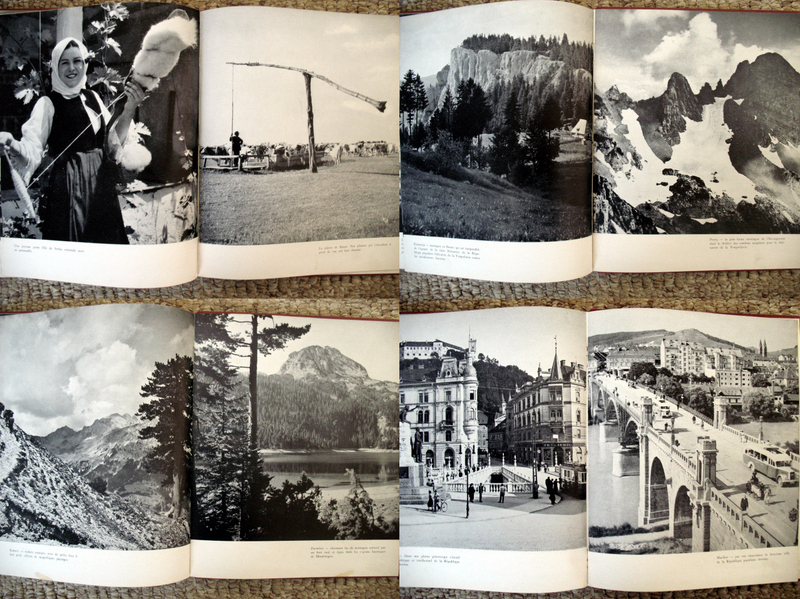 The last section, ‘the land of sun and health’, is a succession of picturesque images of snow-capped mountains and lakes, old and modern townscapes as well as lots of women in traditional costumes. Most of the various entities that made up the former Yugoslavia are represented in these images, which serves to create an illusion of national unity,while allowing a safe display of national and ethnic difference. The celebration of different ethnic identities through traditional costumes and customs are permissible as long as they remain safely consigned to a backward past and do not threaten the Yugoslav ideal. Many of the captions accompanying the landscape images also refer to some battle or event that is a part of the new Yugoslav myth, making the new government appear as the inevitable outcome of what has gone before as well as linking it to the very land itself. 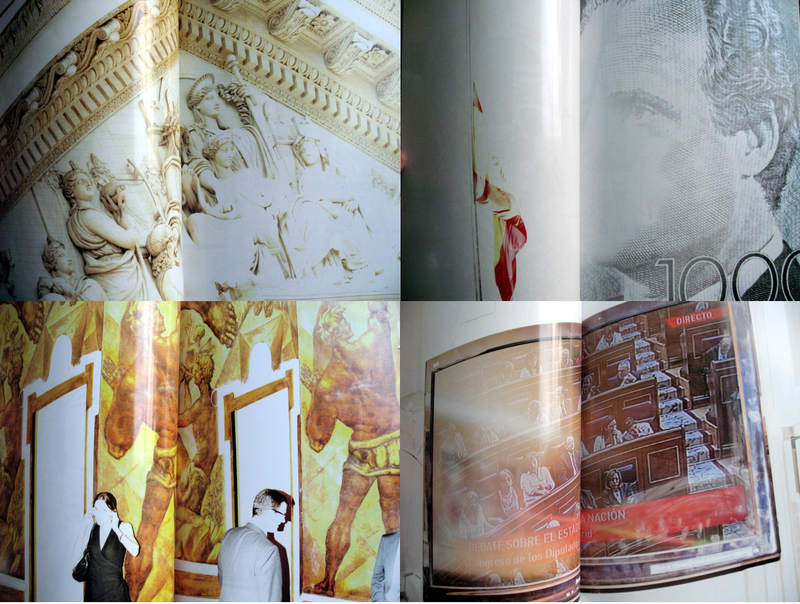 The photographs in this book are in themselves relatively mundane and the design is fairly pedestrian, but that’s not the point. 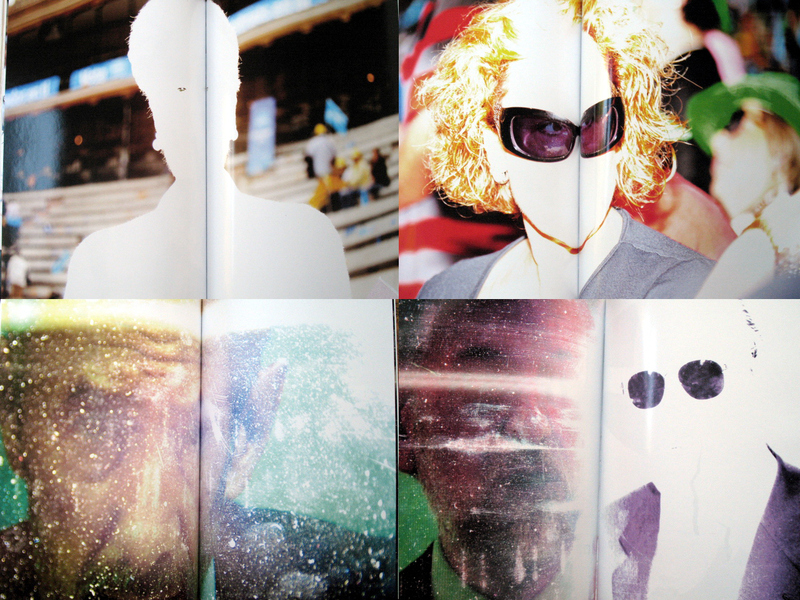 The real purpose of the book is to convince the reader that what they are seeing is the truth (after all, the camera never lies) and photobooks like this are very effective at doing just that.